← Easing student debt won’t cut it. Imagine a year when all our efforts to improve sixth form students’ English and Maths worked for nearly everyone. A year when the English and Maths skills of all those post-16 students who achieved grade 3’s at school improved to at least the standard required to achieve grade 4 in the previous year. Imagine that year also saw much stronger Year 11 achievement in GCSE English and Maths than the year before. Exam boards would be looking at a potential leap in grade 9-4 pass rates with the achievement ‘Bell curve’ shifting sharply to the right. In such a year, would we be allowed a moment of joy to celebrate this dramatic national success story; the genuine raising of standards so fervently wished for by everyone? Why? Because the built-in assumption that each year’s cohort is roughly the same as the last means that results must tend towards ‘comparative outcomes’. So in a very strong year, results are adjusted downwards in a way which has more in common with cohort norm-referencing than criterion referencing. So, in order to avoid dramatic shocks to the system, real improvement is under-reported and students in different years with exactly the same performance can end up with different grades. For post-16 retake students, many of whom are working at the margins of a good grade and are more likely to be achieving near the good grade threshold, this means greater uncertainty about outcomes. These students are being required to retake GCSE English or Maths to demonstrate a level of competence – but it turns out that this level is a moving target; a moving target on a cliff edge. If we are going to set a national threshold standard for English and Maths, it should really be described in terms of what students know and can do. This is the only way we can all be confident that we know when they have actually crossed that threshold. This is far more important than ‘stable’ pass rates from year to year or the politician’s fear of accusations of grade inflation or falling standards every time national achievement rises. Now imagine a year which saw a big increase or decrease in the proportion of candidates achieving a Distinction in their grade 5 piano exam, or the proportion of candidates passing the driving test. Would this lead to soul-searching by the testing bodies or claims about standards? If they were confident that they were applying and interpreting a clear standard consistently for each candidate, the existence of variations would not in themselves require adjustment or ‘comparative outcomes’ to maintain credibility. 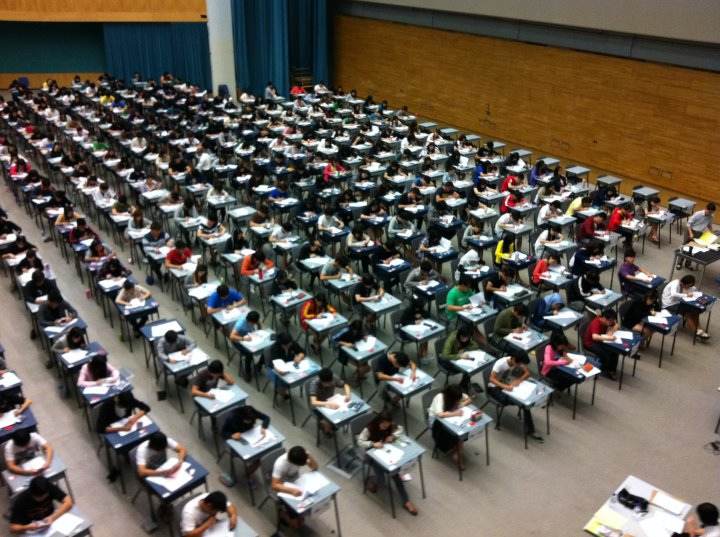 The GCSE retake challenge is a massive preoccupation in many colleges and sixth forms. We all want to develop the literacy and numeracy skills of our students. We all hate the fact that these courses routinely have pass rates below 50% when we expect rates in the 90’s or 80’s for all our other provision. We also hate the uncertainty of the annual grade boundary lottery which disproportionately affects our retakers. These 2 GCSE’s are now the equivalent of a compulsory driving test. Students need to keep taking them until they achieve a good pass. We are setting a national standard by creating a national target. Those of us who are committed to making the policy work don’t want watered-down or more ‘relevant’ versions. We just want to be confident that the grades awarded will be defined by the skills students have demonstrated and that our students’ efforts to reach the threshold are properly recognised. Even advocates of norm-referencing accept the need for national reference tests to establish whether standards are improving across the system from year to year. In the case of GCSE English and Maths, the argument is that they should themselves be national reference tests. It would also be helpful if the ‘stepping stone’ lower level English and Maths qualifications articulated with the content of the GCSE specifications and if students could ‘bank’ their achievement and build on it. Interestingly, an opposite side-effect of the comparative outcomes problem was demonstrated by the kerfuffle around grade thresholds for some modern language exams this summer. For instance, the 17% of A-level German candidates who were native German-speakers managed to achieve 50% of all the A* grades. Concerned private schools had asked boards to look again at grade boundaries because ‘too many’ native speakers were being entered and achieving well, allegedly ‘making it harder’ for non-native speakers to get good grades. But if the grade criteria were clear and stable, we should surely be celebrating the fact that more students are doing better because some of the cohort bring more skills with them. While recognizing that exam requirements and content will change over time, we do need to assert the key principle that we want to grade students as objectively and consistently as possible. And because cohorts vary and teaching does make a difference, we need to be prepared to live with variations in results from year to year; upwards as well as downwards. This entry was posted in Education and tagged achievement, criterion referencing, curriculum, Education, exam results, GCSE English, GCSE Maths, GCSE retakes, norm referencing, skills. Bookmark the permalink.